Play "JunoQuest" and help the Juno spacecraft explore the mysteries of Jupiter. Jupiter is magnificent. It is giant, and at times it appears very big and bright in our night sky. Jupiter is our solar system's largest planet. 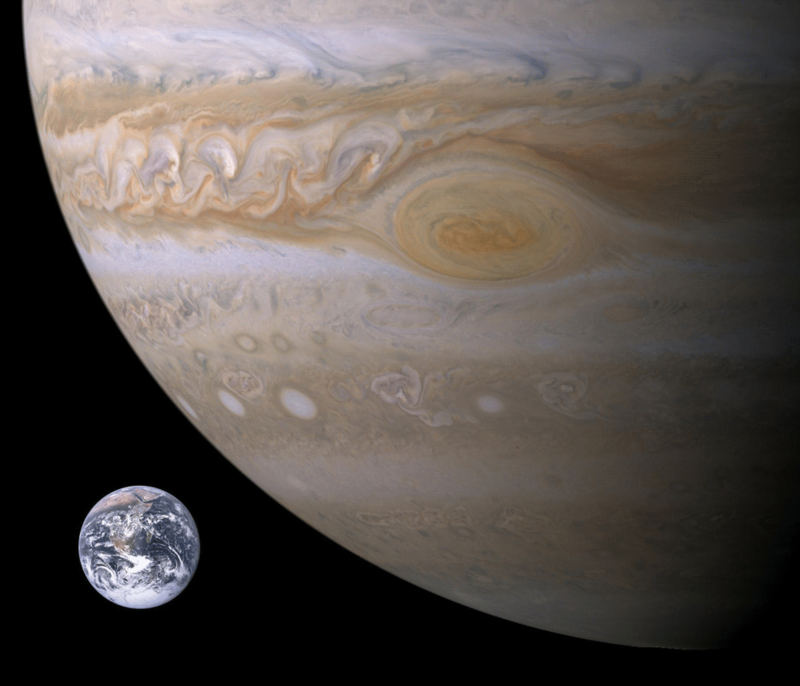 See how tiny Earth is compared to Jupiter. The raging storm known as the "Great Red Spot" on Jupiter could swallow up the whole Earth. Jupiter is called a gas giant planet. It is made of mostly hydrogen and helium, the same materials as the sun. If Jupiter were bigger, could it have become our solar system's second sun? Imagine seeing two suns in the sky! There is a lot about Jupiter we don't know. Scientists want to study Jupiter. They want to find clues to how Jupiter formed and has changed over the 4.6 billion years of our solar system's life. That will also help them to understand the formation of our solar system and other planetary systems around other stars. Juno is a NASA spacecraft to help scientists learn more about Jupiter. Juno launched August 5, 2011, and it went into orbit around Jupiter on July 4, 2016. The slowly spinning spacecraft orbits around Jupiter's poles instead of around its middle. It swings far away, then back toward Jupiter, coming as close as 3,100 miles (5,000 kilometers) above the cloud tops. During the parts of each orbit when it is closest to Jupiter, Juno takes measurements to find out whether Jupiter has a solid planetary core. Juno is also mapping Jupiter's intense magnetic field, measuring the amount of water and ammonia in the deep atmosphere, and observing the planet's auroras. Play JunoQuest and help Juno to take us a giant step forward in our understanding of how giant planets form and what part they play in putting together the rest of the solar system. The name "Juno" comes from Greek and Roman mythology. The god Jupiter (for whom the planet is named) drew a veil of clouds around himself to hide his mischief. Jupiter's wife, the goddess Juno, was able to peer through the clouds and reveal Jupiter's true nature. The Juno spacecraft will also look beneath the clouds to see what the planet is up to. Juno the spacecraft will not be seeking signs of misbehavior, but it will be helping us to understand the planet's structure and history.